Not only are varicose veins be unsightly, they can be very painful. What causes varicose veins and who is at risk for developing them? These questions as well as treatment options will be discussed below. 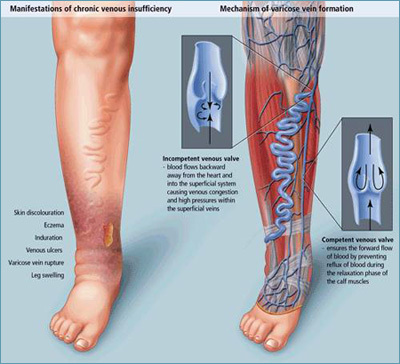 Veins that have become swollen with excessive amounts of blood or have become twisted are called varicose veins. Although this can happen with any vein in the body, varicose veins are most often seen in the legs and feet. This is because as a person stands and walks, the blood tends to pool in the lower parts of the body, which are the legs and feet. Spider veins are a very mild form of varicose veins that are very common. These veins are just a cosmetic issue, and don’t cause pain or discomfort of any sort. Women commonly get spider veins during pregnancy due to the excess weight and fluid in the abdomen. The tell-tale signs of varicose veins include veins that appear dark blue or purple under the skin as well as the appearance of rope-like protrusions in the legs or feet. These protrusions differ from the normal appearance of veins as they are not smooth and even. Varicose veins appear gnarled and twisted under the skin. When the skin around the ankles opens and begins to seep it is an indicator of a serious vascular issue. Medical attention will need to be sought in order to care for these areas as well as to treat the inflammation and/or infection in the legs. Age – Through the normal process of getting older, the veins tend to lose some of their elasticity. As the veins in the legs stretch it makes the valves inside them weak. This allows blood to flow backwards through the veins and pool. Gravity makes the blood flow downward into the lower legs and feet. 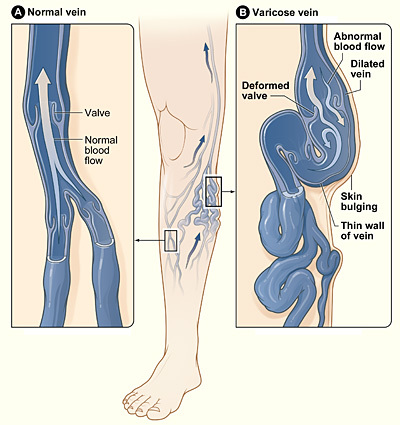 As more blood pools in this area, the veins become varicose. Pregnancy – Another common cause of varicosities is pregnancy. When a woman is pregnant there is an increased amount of blood that is circulating in the body. In addition, the amount of blood that moves from the legs up through the pelvis is decreased because of the woman’s enlarged uterus. Pregnancy may be the first time a woman sees varicose veins in her legs or feet. Women who had varicose veins prior to pregnancy may notice a worsening in the affected veins. Who is at Risk of Developing Varicose Veins? As mentioned above, people are at an increased risk of developing varicose veins as they age. This is true of both genders, although women are more likely to develop them at an earlier age due to pregnancy. In addition, hormones are thought to play a role in developing varicosities. This is another factor that puts women at increased risk. Birth control pills and other methods of birth control that are impregnated with hormones put women at an increased risk as well. People who have a family history of varicose veins are more likely to develop them than those who have no family history. Weight is another risk factor for varicose veins. Being overweight will add pressure to the veins, which can cause increased pressure and pooling of blood in the lower extremities. Profession plays a big role not only in developing varicose veins, but in the worsening or pain of them as well. People who have jobs where they stand or sit for long periods of time may notice that heaviness in the legs or feet towards the end of the day, or have pain from the pooling blood in the legs. In addition, having a job that requires a person to stand in one place can slow the flow of blood through the veins and back up to the heart to be reoxygenated. Most often, varicose veins can be treated without surgery. However, surgical intervention may be required when the varicosities cause pain or discomfort, or when there is an underlying vascular condition. The following treatments range from home care to surgery. One of the simplest ways to reduce the appearance of varicose veins is to lose weight. In addition, avoid wearing clothing that is tight, particularly around the abdomen and thighs. For those who have jobs that require long periods of sitting or standing, try to elevate the legs above the level of the heart a few times each day. Wear compression socks or TED hose. These products come in a variety of sizes and compression. It’s best to obtain measurements from the physician or from the pharmacy staff so as to avoid purchasing the wrong size. If the varicose veins appeared during pregnancy they will likely improve without any surgical intervention. This normally happens as the woman loses weight and additional fluid from pregnancy. Sclerotherapy is a procedure that can be done in the office. This treatment involves injecting a solution directly into the varicose veins with a syringe. The solution causes scar tissue to develop which will close the veins. This treatment is acceptable for smaller varicosities. One of the newest treatments for varicose veins is laser therapy. Lasers use small bursts of light and intense heat, which causes the veins fade or disappear completely. This treatment is done in the office, and is generally used for spider veins. Larger varicose veins can be treated with a catheter-assisted procedure. This procedure involves inserting a catheter into the vein and then heating the tip in order to destroy the affected vein. Severe cases may need what is called a vein stripping. This surgical procedure requires removing a vein through small incisions in the skin. General anesthesia is required for this procedure. Phlebectomy is essentially stripping smaller veins in the legs. This procedure involves local anesthesia, and small puncture-type incisions are made to remove the superficial veins. This is an outpatient procedure. When varicose veins cause skin ulcers an endoscopic venous surgery may be necessary. This is the most invasive type of surgery. Using a catheter equipped with a camera, the surgeon will close and remove the causative veins. This is also done under general anesthesia on an outpatient basis. Varicose veins are a common problem in many adults. Knowing when to treat the veins and what treatment is needed is key to maintaining vascular and overall health. There are various clinic that offers different types of treatments for varicose vein and spider vein treatments. You may find it here. Hi, my name is John (age 32). As an industrial engineer I spend a lot of time on my feet and I had problems with spider veins. Those were solved in one easy treatment and it was successful only because I went to a doctor on time, so guys please educate yourself so you can prevent surgery or worsening of health. Thanks for such detailed article and for sharing these useful and accurate information’s!